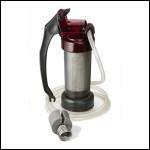 Picking out a backpacking water filter can be a bit daunting. Here we will give you a helpful overview about water filters, how they work and what to look for when buying one. Before we go any farther, we should clarify some terminology you might come across in your research. There is a difference between a water filter and a water purifier. In simple terms, a filter does not remove or destroy viruses, while a purifier does. A filter allows water to pass through an internal device that has many, many tiny holes. And we’re talking tiny. These holes are measured in microns. As the water passes through these holes, the filtration system catches and removes organisms and debris from the water. If the water filter is also a purifier, there will be an additional chemical or electrostatic process that renders viruses inactive. Filter Type – this is referred to as the cartridge. It is the internal device that filters out organisms and debris. There are different types of filter cartridges, such as ceramic or fiberglass. Their construction can affect the quality and price of the filter. Some can be cleaned and reused, while others must be replaced. Although the initial cost might be more, a filter that can be cleaned easily and reused is much more efficient in the long run. This is also where the purification system will be if your filter also purifies water. Pay attention to the internal components of a filter. Some purification systems use an iodine resin. If you are pregnant, have thyroid issues or are allergic to iodine, such a system should be avoided. Pore Size – the pores that allow water to pass through and filter out organisms vary in size. When looking at a backpacking water filter, you will see the terms “absolute pore size”, “nominal pore size” and “average pore size.” You want to pay attention to the absolute pore size. Absolute pore size is the size of the largest particle that can pass through. Pick a filter that has an absolute pore size of at most 0.2 microns, as this is the standard for the smallest of microorganisms. Cleanability – as a filter is used, the organisms and particles it removes remain in the filter. This can cause clogging and make the filter work slower. A filter that allows you to remove and clean the cartridge in the field is very handy. Life Expectancy – how frequently you backpack will determine your needs, but the longer a backpacking water filter can last between cleanings or replacements the better. Usually manufacturers will list approximately how many liters of water can be filtered before maintenance is required. Remember that this number can change depending on the quality of water you’re filtering. Pump Force/Pump Strokes – if you are looking at a hand pump operated filter, pay attention to the pump force and pump strokes. Pump force tells you how many pounds of force are needed per stroke. The higher the number, the more of a workout you’ll get when filtering your water. Pump strokes tell you how many pump strokes are required per liter of water. This gives you an idea of how effective each pump action is and will also give you an idea of how hard you’ll have to work to filter your water. Output – this number tells you how many liters of water can be filtered per minute. This is an estimate of course, but it gives you a good idea of how long it will take to filter your water. This number will change with each use as the filter becomes increasingly clogged. Weight – it’s good to pay attention to how much a backpacking water filter weighs. They can easily weigh over a pound and you don’t want to get one that will add too much weight to your pack.